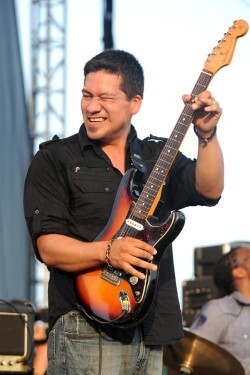 As one of today’s premier guitarists, Indigenous front man Mato Nanji has captivated audiences with his Hendrix-like prowess ever since coming on the scene with his family band’s award-winning 1998 debut Things We Do. The blues world immediately took notice of the young native musicians from the Yankton Sioux Reservation in South Dakota. A prestigious spot on B.B. King’s Blues Tour followed. Their sophomore release was produced by Stevie Ray Vaughan’s co-songwriter Doyle Bramhall. The band earned a much-coveted spot on the Experience Hendrix Tour (Nanji is a roster member) of guitar legends paying tribute to Jimi Hendrix. In 2006, however, the Indigenous siblings chose to go their separate ways, with Mato left to carry on the band’s name and music. Several discs and collaborations later, Nanji is back with The Plateros, a blues-rock power trio of cousins from The Navajo Nation in New Mexico and one of Albuquerque’s hottest acts (we booked The Plateros at Tulsa Roots Rocks the Green in 2013 and they really tore it up). Huge thanks to the Cherokee Nation for sponsoring the day’s events.